A genre mash-up of inspirational teacher movies and underdog sports flicks, Here Comes The Boom is undeniably cheesy and utterly ridiculous, but it's also surprisingly enjoyable, thanks to strong comic performances, likeable characters and direction that gets the tone exactly right. 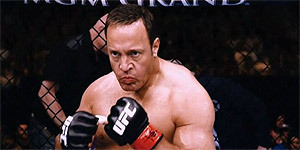 Directed by Frank Coraci, Here Comes The Boom stars Kevin James (who also co-wrote the script) as Scott Voss, a 42 year old high school biology teacher who's inspired to turn mixed martial arts fighter in order to raise the $48,000 his school needs to save their music department. With twinkly-eyed, inspirational music teacher Marty (Henry Winkler) in his corner, Scott recruits Dutch ex-fighter Niko (Bas Rutten) to help him train and soon he's getting seven shades of something knocked out of him in a series of amateur bouts. At the same time, Scott continues his pursuit of hot school nurse Bella (Salma Hayek) and discovers that his multiple injuries in the ring give him the perfect excuse to see more of her. Kevin James has made a career out of playing likeable schlubby losers who make good (see also: Paul Blart: Mall Cop, Zookeeper) and Here Comes The Boom certainly isn't stretching him in that regard. What's more amusing is the naked degree of wish-fulfilment in the script; James has essentially written himself a part where he gets to a) hang out with the Fonz, b) beat up a series of real-life MMA fighters (playing themselves), c) save the day and d) snog Salma Hayek; frankly, if that isn't the Hollywood Dream, then what is? Cunningly, James has also thought fit to cater to his detractors, by writing himself a part where he gets repeatedly punched in the face. In addition, there's strong support from Winkler, Hayek (smoking hot, as always) and Greg Germann (as the school's principal), while Bas Rutten turns out to be something of a scene-stealer as Niko and there's a nice turn from Filipina singer Charice as music student Malia. On top of that, Coraci maintains exactly the right tone throughout, ensuring that the story is played straight, no matter how ridiculous it gets and largely keeping the film's sentimental tendencies to an acceptable level. Essentially, Here Comes The Boom plays like a gentle comedy version of Joel Edgerton's sub-plot from Warrior and if you're prepared to buy into the concept of James as an MMA fighter, then you'll find the film surprisingly hard to dislike. That said, the film never quite achieves any actual belly laughs and is content to settle for consistently amusing rather than laugh-out-loud funny. Despite its patently ridiculous set-up and multiple layers of cheese, Here Comes The Boom is actually surprisingly enjoyable feelgood fare, providing you can buy into the premise in the first place.